Editor’s Note: Laura LaVelle is an attorney and writer who lives in Connecticut, in a not quite 100-year-old house, along with her husband, two daughters, and a cockatiel. She is a fellow alumnus and friend from NYC Parks & Recreation. 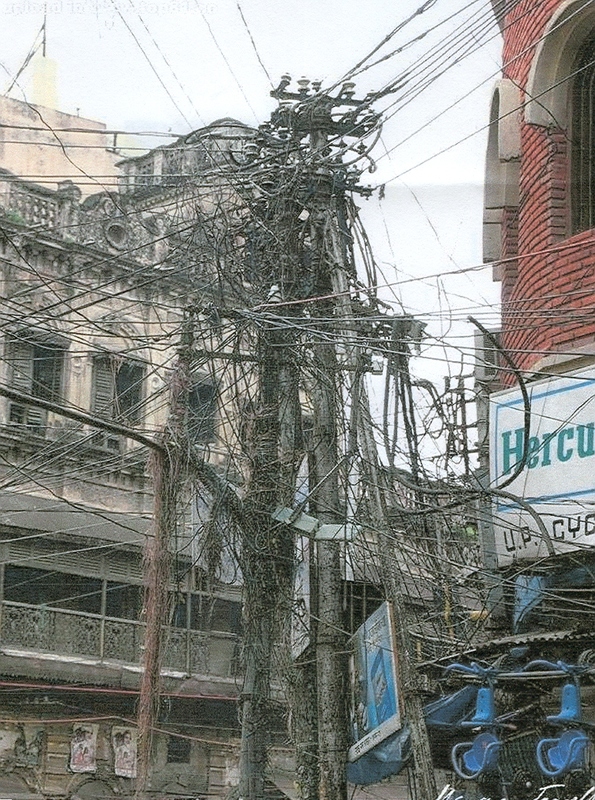 We recently had a nice discussion about US-India relations over at NewsWhistle. Below is the account of her maiden voyage to India to attend a friend’s wedding. 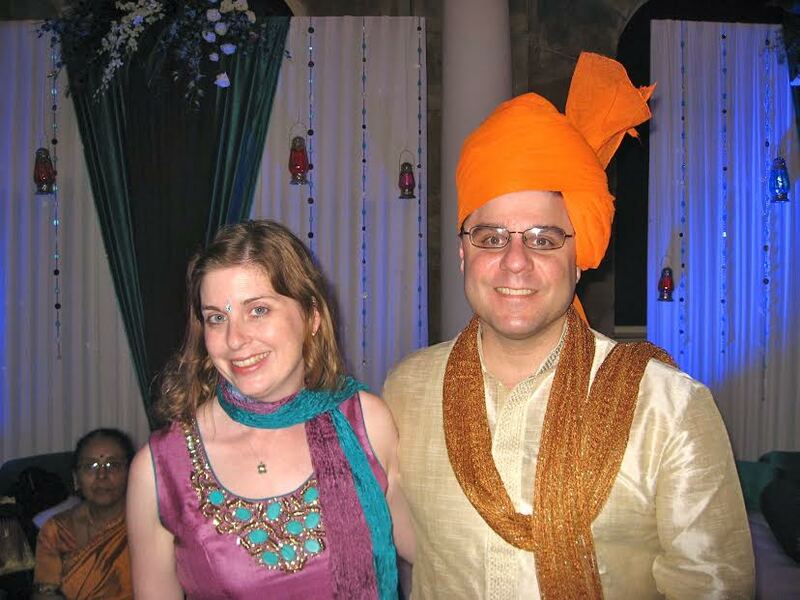 A few years back, I took a trip to India for a friend’s wedding. It was my first time visiting Asia, and I wasn’t quite sure what to expect, but the bride promised that she and her family would take good care of all of their out of town guests—and they did. It started with the mother of the bride asking me for my measurements because she was ordering saris for a whole bunch of us to wear to the ceremony. As I needed to get back to her at short notice, I found myself in my office restroom wrapping myself up in measuring tape—fortunately, strict accuracy was unimportant, as saris are very forgiving. The next order of business was booking a flight for my husband and myself; we ended up flying British Airways, having been warned off of American carriers for cramped conditions and Air India for poor customer service, with a stop at Heathrow and a Bangalore arrival at 4:30 a.m.
And a visa…Americans need visas for travel to India. This was actually a bit of a hassle, having to apply online (and the website was somewhat finicky about operating systems and browsers…I ended up having to go to my husband’s office on a day off, and get assistance from his office manager to get it right). Interestingly, the application asked for our religious affiliation, something I’ve never seen on any kind of US government form. I accidentally managed to indicate that I’m Buddhist on the form and didn’t discover the error until it was too late, so I just hoped that no one would quiz me too closely on the tenets of my professed religion. Fortunately, no one did. The bride’s family offered to send someone to pick us up at the airport, but we didn’t want them to put themselves out, especially at that early hour, so we turned down the offer. After a long haul flight, bleary-eyed and uncomfortable, we set about acquiring some local currency. Fortunately there was a Citibank ATM at the airport, and after gathering our bags, we made our way to the taxi stand. We’d been told to find the official taxi stand, not to take any kind of “gypsy” cab, and that’s just what we did. I was pleasantly surprised to see how many signs at the airport were in English; a holdover from its days as a British colony, English is still one of India’s official languages, which was most convenient for us. The cab ride was quite an intro to Bangalore; a huge city, with over 8 million people, and apparently, only one or two traffic lights in the entire place. And no traffic rules whatsoever. There were pedestrians, mopeds, motorcycles sometimes with entire families hanging on, bicycles, auto rickshaws, carts driven by oxen, luxury vehicles, jalopies, all at maximum speed for their capacity, merrily driving around each other, cutting each other off, circumventing pot holes, crossing over dividers, and passing on the shoulders (left or right, it mattered not). Also cows and dogs in abundance. Our cab driver did not speak English but seemed to understand our destination, a Starwood Resort hotel, and in any event, seemed determined to get us there while attempting a land speed record. I felt for all the world as if I were Jason Bourne being pursued by rogue CIA assassins. We hadn’t the slightest idea of how to ask him to slow down, so we just went with it, and happily with a sigh of relief checked into our hotel when we arrived unscathed. The hotel actually was really lovely, and full of business and leisure travelers from around the world. A few hours later, having slept and bathed, and feeling quite refreshed, we met up with some of the other out of town wedding guests for dinner at the hotel which had several rather good restaurants with varied cuisines. Over the next few days we had an awful lot to do. We went shopping for some Indian clothes, separated by gender. I’m not quite sure what the men got up to but they all ended up looking just fine, and a group of women in our party – several Americans, including the mother of the groom, two women from Italy, and one woman from Japan, along with the bride to be and her mother and aunt hit the stores to purchase salwar kameez (tunic tops with leggings). It was great fun, and we also picked up some bangle bracelets and bindi as matching accessories. We had lunch on that day at a local McDonald’s. I don’t eat much fast food when I’m home, but it was pretty entertaining to try a sandwich on Commercial Road (a major shopping district). They didn’t serve beef – most restaurants in India don’t, but they had fish and chicken and what I ended up eating, a McPaneer (firm cottage cheese). It wasn’t bad, actually…and could probably do quite nicely in the U.S. market if they had the good sense to call it a Spicy McCheesy Fry. The bride’s family hosted us all for various meals at restaurants, their homes, and even had one reception at the Century Club, which was beyond generous and hospitable of them. They also arranged van transportation with much slower and calmer drivers to get us all around town to many different locations at various times. They even hired a dance instructor to attempt (operative word here being “attempt”) to teach us all a routine to perform at the Sangeet, a pre-wedding party. One of the highlights was a walking tour of Bangalore booked through bangalorewalks.com, which was truly phenomenal. We learned so much about the history of the city, and how its history relates to other world events. 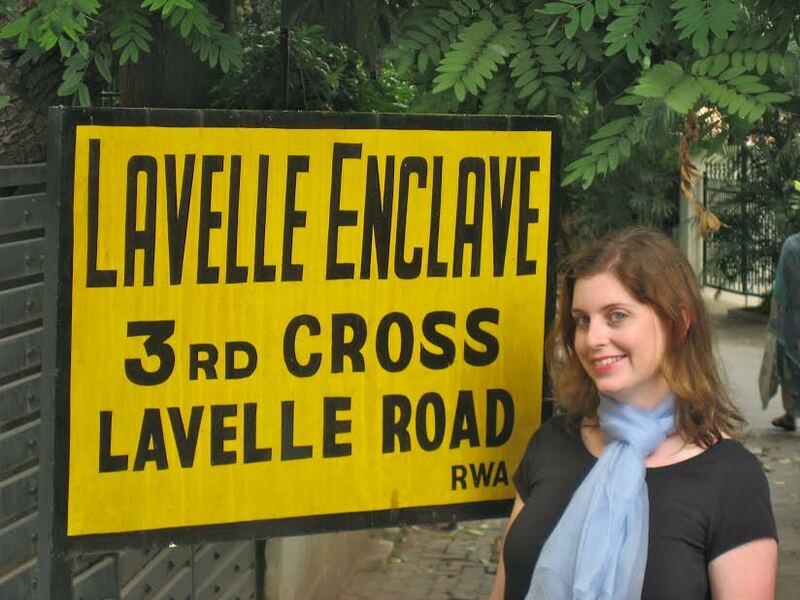 One small footnote in history of particular interest to me: It was an Irishman with the name of Michael Lavelle- perhaps some distant relation of mine, who discovered gold near Bangalore. Due to the need to extract the gold from far below ground, Bangalore was one of the first places in India to have a hydropower electric plant which then led to it being a natural place for the Indian Institute of Science to be established there; this set it on its path to be a science research center and tech hub, even today. On our tour we visited an Anglican church and a Hindu temple, a local food market, saw dogs guarding family cows, some people living much as their families have done for centuries, and sparkling new office buildings and luxury shopping centers existing virtually side by side. Of course, we had to go jewelry shopping. We visited a store owned by some of the bride’s cousins, where jewelry was purchased as family wedding gifts; gold gifts are important parts of Indian wedding rituals. And, some of the rest of us found some nice things to take home as well. The gold jewelry there is 22 karat, not 14 or 18 karat as they sell in the U.S., which means it is much more yellow…and it’s absolutely exquisite. The brother of the groom, a derivatives trader in NYC, pointed out that his mother has historically been the best investor in their family, having bought gold for so many years. The price of gold was, then, at a historic high. The women were treated to a Mendhi party (our hands were decorated with beautiful, intricate henna designs) prior to the Sangeet, and we couldn’t stop taking pictures of ourselves. We put our newly-purchased Indian finery on and had a terrific time dancing rather badly. The men all were given turbans to wear as they arrived, and we took a bunch of pictures of them, too. I was amused to find that there was an Irish pub in the hotel where the Sangeet took place; my people seem to be just about everywhere. The bride performed an absolutely lovely dance, putting the rest of us to shame; then again, she’d had more than just one lesson. 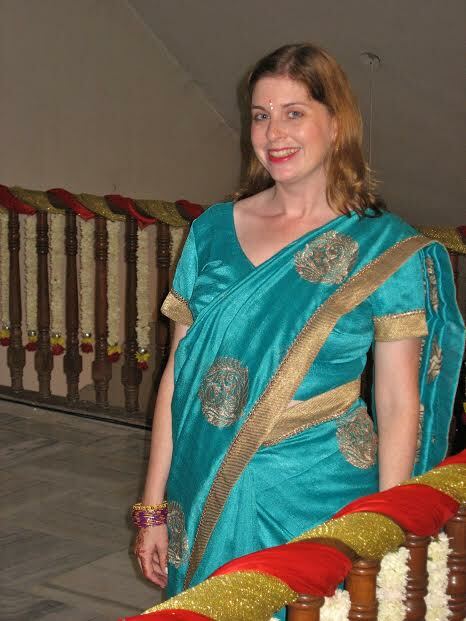 For the actual wedding, we had to get up in the wee hours of the morning; we were taken to where the ceremony would be and had dressers on hand assisting us into our saris – a good thing, too, because I, for one, would never have been able to get the thing on without professional help. Again, we took hundreds of pictures. Then we were rushed outside to see the groom arrive on a white horse! He looked a bit frightened up there. He’s an Italian-American from New Jersey…this was not at all the sort of thing he was used to, but soon he grew more accustomed to it, and we on the ground had a terrific time dancing around and enjoying the festivities greatly. Of course, we were in no danger of falling off. The musicians did a great job and didn’t want to stop playing. Then again, they were hoping for more pay—and I think they received it, from the aforementioned derivative-trading brother of the bride. Apparently, they’d tried to arrange for an elephant, but no elephant could be had for love or money. The horse, however, was spectacular enough, particularly at 6:00 a.m. The wedding itself lasted for hours, during which we were served both breakfast and lunch. We were also gifted with coconuts and garlands of flowers. The out of town guests, including myself, were not at all sure what was going on for much of the time, but we enjoyed it tremendously regardless; the beauty, the colorful flowers everywhere, the silk saris, the many people, the happy occasion. Perhaps because the ceremonies take so long, they aren’t nearly as serious and solemn as the many church weddings I’ve been to in the United States…people are chatting, catching up with their friends and relatives, wandering in and out, getting a bite to eat. One of the bride’s relations took some of us out for a short drive to see a local temple sometime in the middle of it, figuring that we had some time to spare. At the end, they were married, and they looked as happy as could be. That evening, we all went to a cocktail party on a hotel rooftop. Bangalore has a lovely, temperate climate, and it was remarkably like being in New York City on a summer evening after the sun goes down. Even more so because the UB Tower, which we had a perfect view of, is extremely reminiscent of the Empire State Building. Before we all parted ways, we visited yet more of the bride’s relatives for a water throwing ceremony. It was not the right time of year for Holi but we all enthusiastically participated, getting soaking wet, very colorful (thanks to liberal applications of turmeric and kum kum powder), and extremely messy in the process. A good icebreaker, though. It’s hard not to have a good time when young and old are busy making the crowd into a rainbow-hued mess. Some of the guests were going on to do the tourist bit and see the Taj Mahal at Agra; others were off to do some yoga and meditation. The bride and groom were off to honeymoon in the Maldives. And we had to head back to our jobs, our young daughter whom we’d left behind for a week, and the routines of our regular lives. I hope very much to go back again someday and see more. Most of what I remember, though was absolutely positive: friends and relatives who made us feel welcome and included, a wonderful celebration of two really sweet people, new sights and delicious food, and a sense of being far, far from home, but among fellow travelers on this planet. 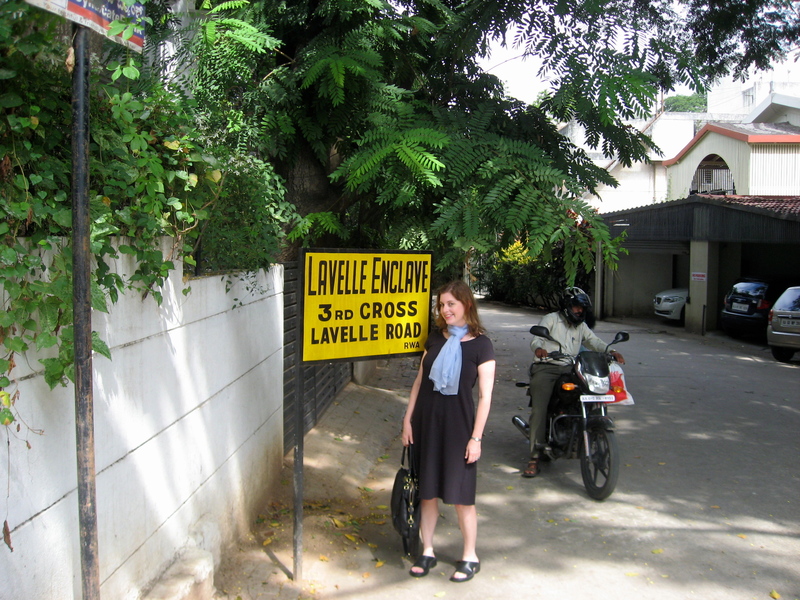 Posted on October 2, 2015, in Consular/Travel, Culture and tagged Bangalore, Indian-American, Indo-US, Laura LaVelle, US-India, US-India Relations. Bookmark the permalink. Leave a comment.